Career development plan as the project managers for sustainable community capacity development. The Career Builder System is being used to in their projects to enable people to get access to work. Careerdevelopmentplan.net offers the foolproof Career Builder System, where people move from their perceived career boxes that are all mind-based and self-made. They move easily, safely, smoothly, to having great careers of their choice and growing their list of skills and what they can add to the world. We look at career choice, access and ongoing growth. Career change, career growth and career choice can be a very exciting experience. The Career Builder System makes it clear and easy. This is the secure and safe way towards your ideal work, career, job, company and even more. The process is also on the web, as you learn it you can take it to people around you basically free. You can determine where they want to join and understand their own direction, their own measurements, and their own solutions. They participate in the program and help the people who deliver make a living. Careerdevelopmentplan.net offers the model: Towards my ideal job. At any stage of life, from primary school all the way to retirement and beyond. We find that the biggest obstacle is that people perceive career boxes, it’s like a glass plate, where they can see everything that can be, they see others have it and they don’t understand why it is not theirs as well. What careerdevelopmentplan.net’s product Career Maker does, it makes that box disappear by removing fears, the concept of failure and the perceived risks. We find that people need clarity about their work in their job, their job in the company and their location. Everybody has a store, so do you. Your store needs to be identified, and we find people find it very tough to identify their own store. This is universal: professors, rich business people and the poorest of people. Everybody is created as great people; the difference is just their experiences, expertise, interest, aptitude and relationships, some of us at home get in bigger doses. The resources you need are all out there. It’s all available, easily accessible, no problem at all if you know how to do it. In the process of moving from where you are to where you want to be, you make your own staircase and you climb it. Making and climbing at the same time could be a very scary thing; therefore we have made the process simple and clear. This process comes from Hewlett Packard where I worked, all the companies I’ve been involved in, that grew to multi-million dollar companies, coaching for many people afterward and much pro bono work at universities, schools, communities. The process is now very clear and simple. It starts with exploring with the aim of identifying your real needs. Reassess the work you do, your job, the company and the industry you’re in, ensure that it suits you and align with your wishes. You then prepare this information in a very simple way with people around you and people you choose. You get your communication clear so you can engage the right people. In the process of going external to the resources you internalize the competencies, the knowledge, the insights; you grow your store all the time. Your assets grow in every action that we take in this process. You will end having up your job, industry and company perfectly aligned to your needs, it’s not instant but it’s very simple to do, it may take 18 months to 3 years. You are in charge or your future and your career aims, to align them and to keep them aligned. You will get your career aims so clear, it’s almost like a beacon that you can put out there, that shines for you. This beacon must go out to the people around you; it must preferably go out on the web, where we include web reputation management. You gain the insights, you gain the knowledge, and you gain absolute confidence because you are a man with a clear plan. A man with a clear plan grows without stopping, he is welcome everywhere, while people usually run away from a man that asks for help. Thus, you’ve moved and escaped from the perceived career box all the way across to an almost limitless world. This world is available and accessible to anybody that follows these steps with us. It doesn’t matter where you start from, if you have fewer assets in the beginning, it just takes a little longer. We offer a process where you earn while you learn, so you can pay for this yourself all the way through. The process is an organized process where the career owner is in charge. The career builder, the career maker is in charge. There are detailed processes that we must keep ordered, and if these processes are not completed you simply loop back and do it again, while you acknowledge the learning and you help us with new groups. In the end you end up with practical work experience and you are ready to go to the workplace. This is organized in four levels and four phases. It doesn’t matter how long you take at any one of these, you repeat it until you are successful and you know where you know, you know what you want, you can communicate what you want, and you are a man with a plan. In the process you have moved from the career box all the way through to a great place where careers become simple and straightforward with no perceived problems. If you look at the career box, it has definitely disappeared because it was perceived. Once you have moved clearly you can see this move means you invest with others, it is an investment, and it is a commitment. People must be committed to their own future to complete this process. 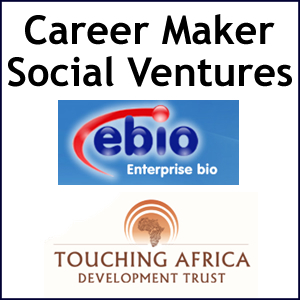 In conclusion, the foolproof Career Maker System was developed and driven by Unre Visagie with many other people. The career box was broken and you move to a great space. With Prof. Japie Kroon we offer a community gap year with an approved program. It is linked to short courses that he developed specifically for this gap year process. You end up with a university level 6 short course certificate. Explore the opportunity with Secoza.co.za. We offer community upliftment that goes home to people, into their schools and into their leaders. It‘s always supervised by their leaders. Let’s have a look at the process offered by them, by looking at this early stage actual brochure. They move from exposure to opportunities to earn and learn. They explain investors from scorecards; this is integrated in a very unique way which we have tested with Inala technologies, spending their money very effectively over time. The process took about 4, 5 years. Other investors could be embassies which we have engaged with in the past, and we have several philanthropic people who are very happy to invest in a clear program. The investors are insured of great returns. Returns on their investment means more business and better employees, they can’t lose. It also means investment in community economic capacity growth which means their business can grow in the long-term. The return for investors is high, clear and now very safe. The impact is very wide: we train the trainer, and from train the trainer the process keeps rolling at very low cost. There’s even matric bridging courses at under R1500 for the year. The school earns most of the 1500 and the people from Touching Africa and their offices they operate from, engineering offices, where they have resources to make sure this is on track. With Prof. Japie from North-West who ensures the learning experience stays on track. And with Unre Visagie from business to ensure the business processes stays on track. As a team we were inspired from many years of tackling unnecessary divides and stratification in our communities. We cannot lose. The reasons for failure are articulated with the initial outcomes, and an industry accepted speech test and an ebio learning methodology supervised by Prof. Japie from North-West University. Phase 2 gets them closer to work ready; they become a worker that acts as an owner. I have learnt these words from David Packard: “An army of owners”. This is from Hewlett-Packard in the late seventies. If you go onto Dave Packard’s site you will find those words; it’s what Hewlett Packard created. Your company will get an army of owners from us. It changes their attitude completely, where they are intrinsically in control of their own future, they realize that the door to success has a handle on the inside only. Those glass plates just disappear, those perceived boxes are gone. They are in a great space. They master communication skills; they are clear about their industry, career, job and work. They have willingness; they absolutely have the skills to be highly employable. We have a long record with various government programs and companies, where our people stand out and win out as top performers. I really hope you will join us in this process, how can you possibly lose? I don’t see how. Thank you very much, I hope you have enjoyed the story, and if you are interested in community upliftment programs, talk to Touching Africa. If you are interested in business programs, talk to Unre Visagie. We will work with Touching Arica and we used to work with Prof. Japie Kroon. A very effective process: earn while you learn is included for community gap years in your community at. Contact careerdevelopmentplan.net and we will work with Prof. Japie to deliver the community gap year. I thank you so much; I hope you enjoyed it as much as I enjoy bringing this to you. This program is a passion for me, I’m really retired, but I work 70 hours a week to help people break their career boxes, move into great spaces and I can’t think of anything else that I will enjoy more.